Nothing in Venice can be expressed without a superlative! Its canals are grand, its architecture is extraordinary, its history is ancient, and its geography is perplexing. Known by many monikers, Venice is the city built over 118 islands and connected by over 400 bridges. 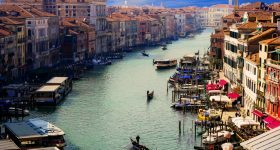 One of the wealthiest cities of the world, Venice drew traders from all around the globe back in 700 A.D., shift to the present, and it draws over 20 million travelers each year on a quest to explore its treasures. February is the best time to explore the city in its avatars as an idyllic European town awaiting spring, and kicking up a riot at the year’s most awaited festival – the Carnival! Here is a guide to all the fantastic things to see and do in Venice in February. What makes Venice in February Special? Mild Adriatic Winters – Venice does experience winters, and temperatures vary around 8°C, but unlike major tourist destinations across the world, it does not snow! Plodding through snow is not always fun, but Venice offers a charming alternative. It is the best time to explore the streets and canals without the humidity of Venetian summer! Frenzy of the Carnival – The Venetian Carnival is a whirlwind of events and activities that celebrate the spirit of Venice. It is the main festival of the year and everyone gears up for a bonanza that will be talked about until the next year. Solitude and Swarms – You can pick the kind of Venice you want to experience in February. The first ten days of the month are empty of tourists; especially the cruise ships are gone. And from right before the start of Carnival tourists keep filling in for the biggest crowds you can ever experience in Venice! Venice is still in the throes of winter in February, although it is warmer than January and day time temperatures reach around 8°C. It is often cloudy, and there is likely a chance of rain, thankfully the days of acqua alta are far behind! There is an average of ten hours of sunlight. The 12th-century palace of the Doge’s was the administrative and legislative center of Venice. A marvelous representation of Venetian Gothic architecture, its main highlights include the Doge’s apartments, Bridge of Sighs and New Prisons. Catch the art exhibition ‘Canaletto and Venice’ at the Doge’s Apartments all through February. For over a millennium, the St. Mark’s Basilica has been a shining jewel in all of Christendom. It was nicknamed the Chiesa d’Oro thanks to its gold mosaics with exceptional artwork. February is a lean month without any holidays and gives you more opportunities to explore the church and the museum. The image of a sleek gondola snaking through the canals is what comes to mind when one thinks of Venice. The best way to experience is it with a serenade accompanied by a live musician. Wrap it up early before the chilly February evenings set in! The Phoenix Theatre or Teatro La Fenice is Venice’s leading Opera House and a pioneer in Italian theatre for centuries. In February you can enjoy the following Opera performances - Mozart’s ‘ Il Sogno Di Scipione’ and ‘Il Re Pastore’ and Gioachino Rossini’s ‘ L’Italiana in Algeri’ and Marco Angiu’s Concert. The word ‘Ghetto’ comes from the area Campo of the Ghetto Novo where the Jewish community was segregated in the 14th century. The museum situated in the same area now covers a brief yet educative history of the community and its traditions and has a lot of artifacts and documents. 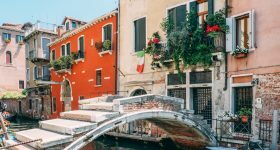 Bring some color to your chilly February days in Venice by going on an offbeat tour of Venetian Islands. 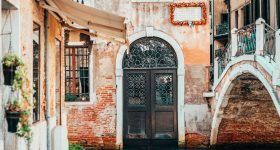 Stop at Murano and marvel at the ancient glass-making method, take photographs at the colorful houses of Burano and step back in time in the village of Torcello with its ancient churches and crumbling buildings. 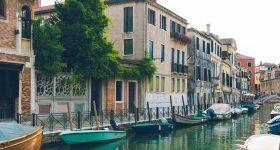 Read all about taking a trip to the Islands of Murano, Burano and Torcello and plan your day trip efficiently. Artist, Sculptor, Engineer, Scientist, Musician, Botanist, Inventor - Leonardo Da Vinci was a genius who donned multiple hats. The museum is an ode to his genius and contains over 60 working models of his inventions and multimedia displays of his art and inventions narrating his hopes and dreams. In 1804 when Napoleon invaded Venice, he banned all burials on the main island and hence they shifted all burials to the island of San Michele in the lagoon. The island is used solely as a cemetery and contains tombs of prolific residents. It is a serene and interesting catalog of Venice’s history. Venice is a pedestrian city, and a walking tour across the canals, bridges and its cobblestone streets is the best way to explore it. On this tour, you will enjoy commentary from an expert guide who will narrate the history of the city and its landmarks. The Rialto Market near the famous Rialto Bridge has been running since 1097, as is known through extensive documentation of the city! The market has fresh produce that is purchased by locals and restaurants. In February you can find amazing varieties of fish that are freshly caught! The Carnevale is the biggest event on the Venetian Calendar and is an extravagant two-week long celebration of Venetian culture. Masked parades, costume balls, food fairs, boat parades, children’s fairs, live performances, and much more happens in the Carnival frenzy. The main parade happens on 17th February at the Grand Canal. 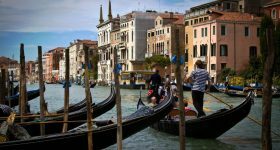 Celebrate Valentine’s Day in Venice and profess your love for your partner while serenading them on a gondola tour, and stop for a quick kiss under the Bridge of Sighs. It will be one for the records! Many events and special offers are extended to couples in restaurants, hotels, and even museums in Venice. 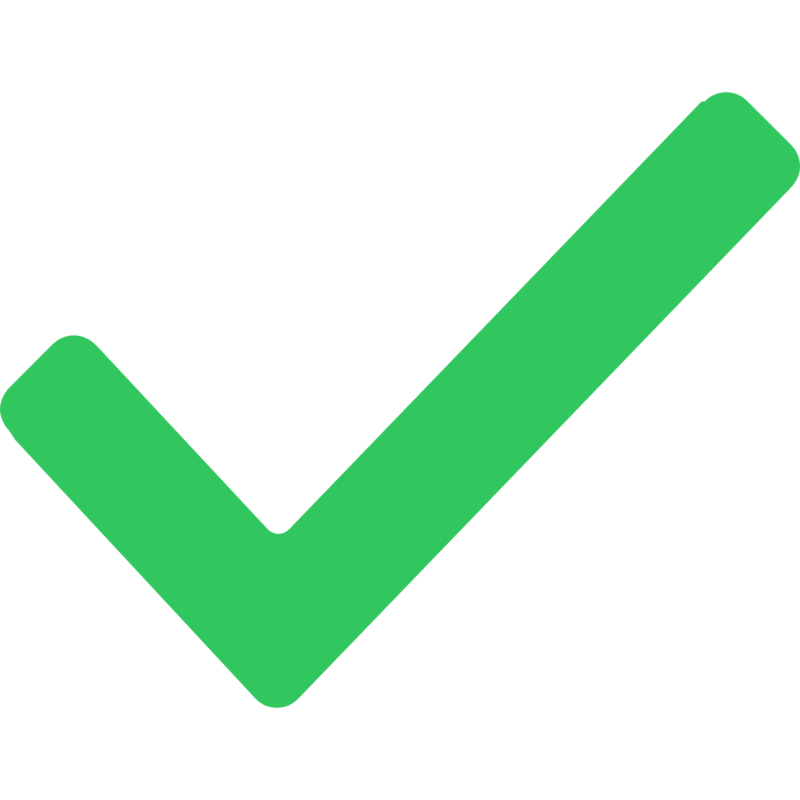 February is chilly, and the average temperature is 8°C, with day time temperatures touching 10°C and night time as low as 0°C. There is a likelihood of ten days of rainfall and high humidity. The sun rises around 7 AM and sets around 5: 30 PM leaving a lot of time for sightseeing. 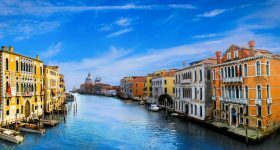 Venice is one of the top tourist destinations worldwide and has a variety of accommodation to suit every type of traveler. However, the city space is limited and you will have to choose accommodation on the mainland for cheaper options. Vaporetto – It’s the main ferry service run by ACTV Public Transport Services, they have multiple routes connecting major points. You can use a ACTV Pass to avoid buying tickets each time. Water Taxi – Just like overland taxi, you can hail it from the pickup points on the canals and travel to your destination in style. While vaporettos, gondolas and traghettos are mostly used to travel within the Venetian lagoon, water taxis are mostly used to shuttle back and forth the Marco Polo airport. Grab your discounted water taxi pass before arriving in Venice and leave the airport with no hassles! The meaty wholesome flavor of eggplant combines with the finest parmesan to make this traditional Italian dish, the Eggplant Parmesan. Every restaurant has its special recipe, but this baked dish is the ultimate comfort food to dig in, on those cold February evenings. Egg, cheese, potato, how can any dish with these ingredients ever go wrong? Gnocchi is a delightful dumpling made with wheat, potato and lathered in hearty sauces. The thick and soft dumplings while high on calories is ideal winter food and high on taste and satisfaction! A rich, creamy rice dish of Risotto is what will drive the winter blues away! The dish is made of flavourful rice with lots of winter vegetables like radish, and butternut squash and garnished with lots of butter and cheese. You can’t have enough of this flavor bomb. No list of Italian foods is complete without a pasta dish! The Lasagna Bolognese is a perfect winter food that is layers of lasagne with Bolognese sauce made of beef, veal, red wine, and tomatoes. Add a generous helping of parmesan, and it’s good to go! The St. Mark’s Basilica is beautifully illuminated to highlight the murals and mosaics once in a day from 11:30 AM to 12:45 PM. Plan your day to be present there during the time as during February the natural light may not be enough due to cloudy days, to appreciate the mosaics. The Carneval time is a very busy period and the Vaporetto boats fill up as soon as they dock. 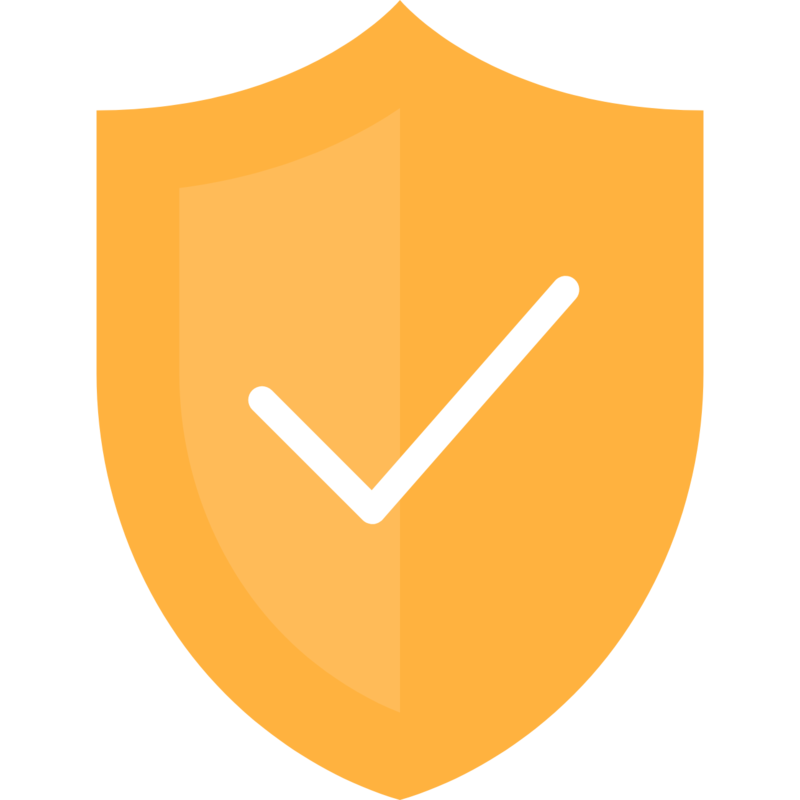 You can save time by buying a pass and spending a few minutes waiting for the next boat, instead of going away to come back for the boat. A good mask for the Carnival costs more than 50 EUR and is usually handmade and of papier-mâché. Some of the shops where you can buy authentic masks are Ca’ Macana, Ca’ del Sol, Tragicomica, Papier Mache, and Bluemoon Venice. However, during Carneval time several pop-up shops open up selling factory-made masks for about 10-15 EUR, do not spend more than that! An artificial ice-skating rink is set up at Venice’s Campo San Polo. On weekdays the rink is open from 3 PM to 7 PM and on weekends it is open from 11 AM to 7 PM. The entry costs 12 EUR including skate rental. Venice has a lot of art galleries and museums, some of the temporary collections in February are – ‘Postwar European and American Art from the Schulhof Collection’ at Peggy Guggenheim Collection, ‘Giovanni Soccol Presence-Absence’ at Ca Pesaro Library, and ‘Venice and Saint Petersburg. Artists, Princes and Merchants’ at Centro Culturale Candiani. If you're an art enthusiast, February is a great time to visit Venice. Planning to Visit Venice in February?